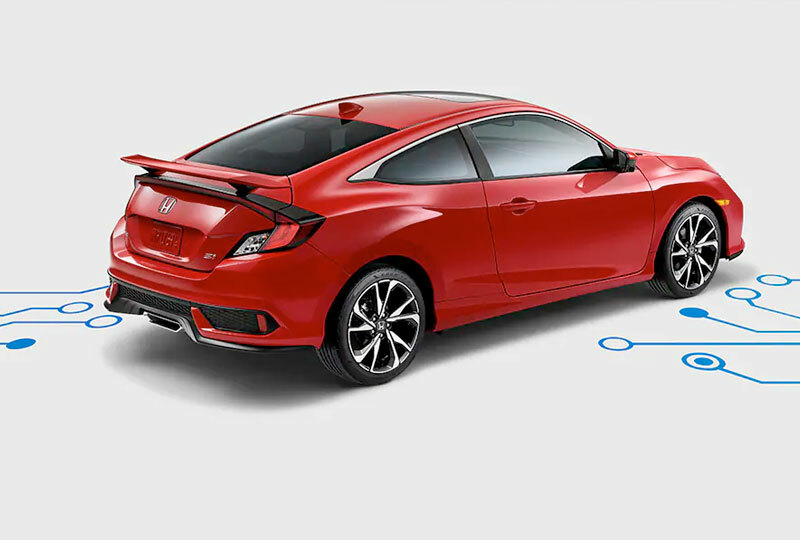 The 2019 Honda Civic Si Coupe from Coconut Point Honda in Estero, FL - serving Cape Coral, Fort Myers, Naples, Marco Island, Collier, Lee, Hendry, and Charlotte Counties - is a sleek compact sports car that handles beautifully. It has a smooth aerodynamic design with angular lines that enhances bold features like 18-inch machine finished alloy wheels, a body-colored wing spoiler, and an aggressive sport bumper with gloss black grille. Underneath the hood, you'll find a forceful 1.5L Inline 4-cylinder turbocharged engine with 205 horsepower and 192 lb.-ft. of torque. An active damper system promotes smooth driving and handling, while the 6-speed manual transmission with helical limited-slip differential gives you the ultimate control on tight corners. Deep-bolstered sport seats with red stitching help keep you in place while taking those corners. Projector-beam headlights with auto on/off and taillights with integrated LED light bars show the world exactly where you are when hitting the streets at night. Open up the one-touch power moonroof with tilt feature to feel the open air on your face while tearing down the interstate. The 450-watt premium audio system with 10 speakers, including a subwoofer, plays high-quality music to match your exciting ride. Now is the perfect time to buy a new Honda. The 2019 models are here and they are incredible! Our showroom at 22240 S Tamiami Trail in Estero, FL is fully stocked and our specials are not to be missed. 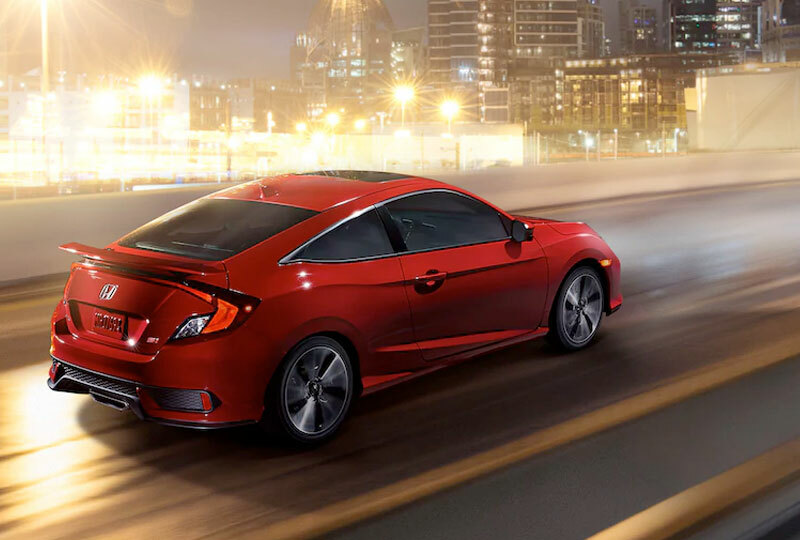 Let us help your dreams of owning a 2019 Honda Civic Si Coupe come true! 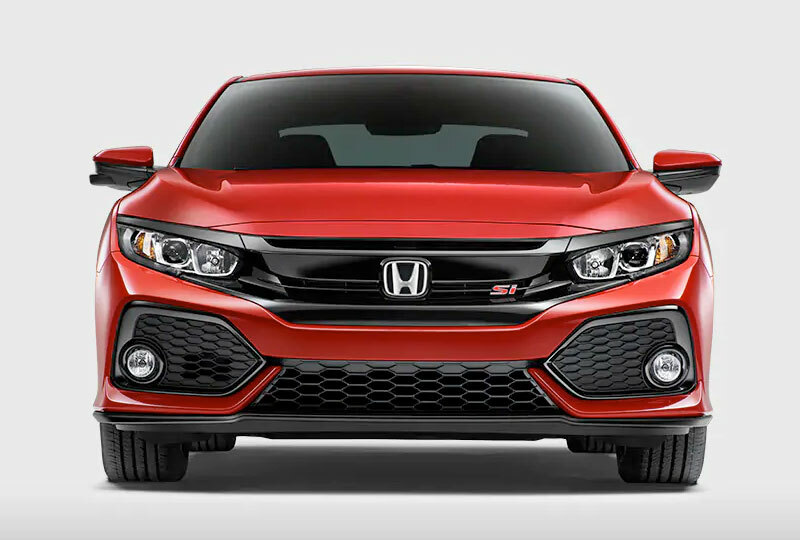 An aggressive sport bumper - with the legendary red Si badge and a menacing gloss black grille - makes the Civic Si Coupe hard to miss.